TEDSIG held their annual Spring Meeting on May 2, 2008 at OHIONET with 36 in attendance. The topic of the day was “Institutional Repositories: Tools and techniques for setting them up and filling them up.” After a brief TEDSIG business meeting, Timothy Robson, Deputy Director of Case Western Reserve University’s Kelvin Smith Library, talked about the set-up and governance of institutional repositories (IR’s). Robson’s talk emphasized the key to success with an IR is collaboration and commitment from both the library and the university. Thomas Hayes, Head of Digital Library Programs at Case Western, explored how to acquire content and involve faculty and community in the IR. Hayes stressed to make the case for IRs, you need to emphasize the benefits, dispel confusion and fears, get the university community involved, and if desired, provide financial incentives. The third speaker of the day, The Ohio State University’s Metadata Librarian, Maureen Walsh, discussed basic metadata issues focusing on OSU’s experiences with their Knowledge Bank IR. The final session was an “IR Question and Answer” session, in which all the speakers fielded questions from attendees. During the business meeting TEDSIG’s new mascot, TEDS, made his debut. 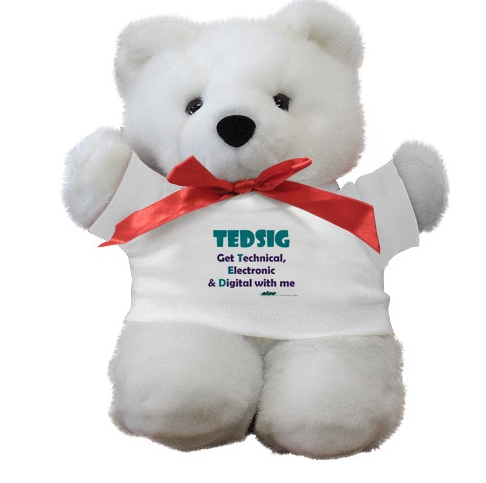 Speaker Maureen Walsh, a TEDSIG Discussion and Steering Committee member who proposed the idea of a TEDSIG mascot, was presented with the very first TEDS. Door prize winner, Tina Valerius of Capital University, also received a TEDS and a gift certificate to Barnes and Noble. TEDSIG Co-Chairs, Deberah England of Wright State University and Rocki Strader of The Ohio State University would like to express their appreciation to all involved in making the 2008 Spring Meeting a success.